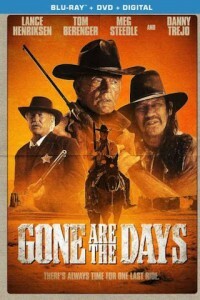 Academy Award nominee Tom Berenger (1986, Best Supporting Actor, Platoon), Lance Henriksen, Meg Steedle and Danny Trejostar in the exciting western Gone Are the Days DVD. Danny Trejo, Lance Henriksen, and Tom Berenger headline this epic Western saga of a fading gunman’s quest for justice. Seeing his days are growing short, Taylon (Henriksen) rises from his deathbed, puts on his spurs, and hits the trail in search of redemption. He crosses the desert to a gold-rush town, where he finds his estranged daughter working in a brothel. But to earn her freedom, he must confront the town’s vengeful sheriff (Berenger) — who has an old score to settle with Taylon.